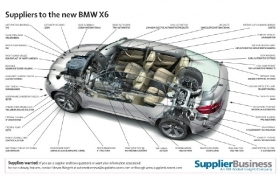 GKN Driveline of the U.K. and Germanys ZF Friedrichshafen jointly developed the BMW X6s new standard feature called Dynamic Performance Control. The feature continuously distributes drive power along the rear axle between the left and right wheels. Four-wheel-drive vehicles tend to understeer during high-speed cornering. The system helps minimize this by increasing the torque applied to the outer wheel. GKN Driveline and ZF say the feature is superior to those from rivals as it functions adequately when speed remains constant. For example, electronic stability control requires deceleration for the system to engage. Brose of Germany delivers electrical window regulators and electrical head rests for the X6. Frances Faurecia provides the X6s instrument panel for which Germanys Draexlmaiersupplies the leather covering. South Carolina. The starting prices for the X6 in Germany is 57,900 euros.